On the plus side, the restaurant on Congress Street in Portland is never boring. Anusat Limsitong, who also operates Thai 9 in Scarborough, opened his new restaurant in July. Here he prepares a chirashi poké bowl. In small cities around North America, poké is on the rise. It has already taken its star turn in larger metropolises like New York and Los Angeles, but everywhere else, Hawaiian-style cubed fish and rice remains in full ascent. For the moment. Portland is no exception. At the start of 2017, we got our first poké restaurant. Today, we have four, including one that resides in the same space where cupcakes, last decade’s hot new thing, were once sold. BOTTOM LINE: Hawaiian poké might just be the trendiest dish in the nation right now. 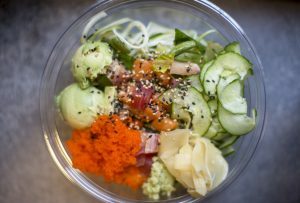 Portland’s first poké restaurant opened in early 2017, and just three months ago, Poké Pop, a new competitor, took over a former salon space in the Arts District on Congress Street. 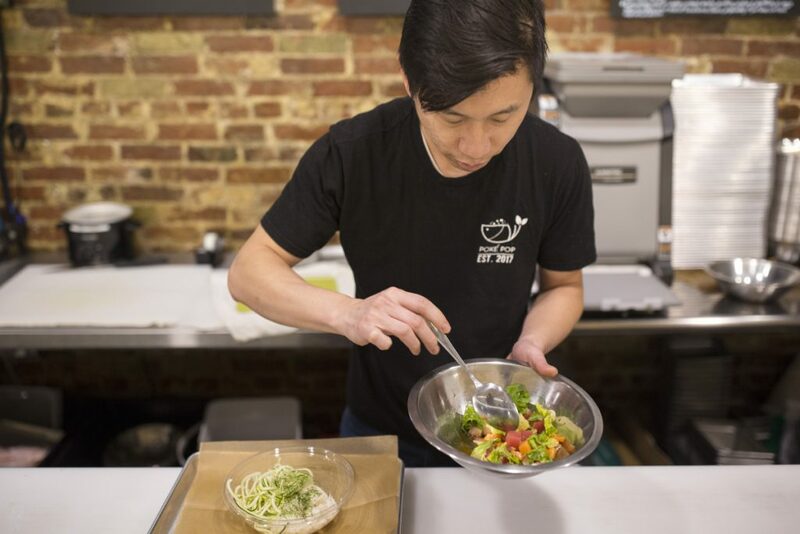 Named for chef/owner Anusat “Pop” Limsitong, the restaurant is a confusion of fusion, with cross-cultural elements intended to enliven bowls of cubed protein, vegetables and rice. By and large, these tweaks are unnecessary and involve sickly sweet sauces that make Poké Pop’s signature dish a huge letdown. If you must order poké, stick to the tofu bowl and customize your order with a squirt of the soy-based shoyu umami sauce, the least sweet of the restaurant’s offerings. But if it’s sweetness you’re after, Poké Pop has you covered. Its bing soo shaved ice, which is really a Filipino halo halo parfait made with fruit ice cream, shaved milk ice and about a thousand other ingredients, is terrific, even though it takes 15 minutes to prepare each one. 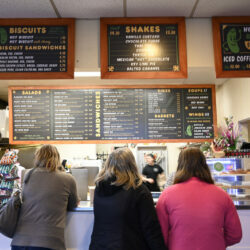 Order, then get lost in the anime-inspired mural or the embedded flat-screen television that displays positive internet reviews of the restaurant. You certainly will not leave bored. It may not be the poké restaurant we need, but it is the poké restaurant we deserve. Nowhere is the Thai influence more apparent than in the tom yum soup ($3.95), a new, off-the-official-menu side dish that Limsitong prepares from a traditional hot-and-sour paste of lemongrass, galangal, hot chili and lime juice. To make each portion, he adds the aromatic paste to a steaming cup of vegetable broth, along with soft tofu and a sprinkle of green onion and cilantro. It’s a lovely, refreshing bowl of soup. But wait, you might protest: It’s not Hawaiian; it’s not Japanese, and it’s certainly not poké. Hang on. Hold my beer. Try the tom yum poké bowl ($10.95), served over rice, salad greens or angel-hair-thin zucchini noodles. Here, Limsitong blends the same paste used for the soup with sweet chili sauce and tosses it with scallops, shrimp and romaine lettuce. Mixing cloyingly sweet sauce with cherry tomatoes and slivers of onion catalyzes a bizarre flavor alchemy that conjures something eerily similar to a spicy, store-bought marinara. 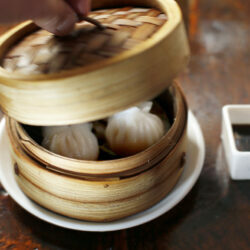 Exactly nobody wants that coating their raw seafood, rice and salad greens. 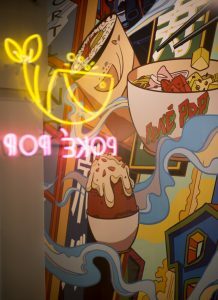 The neon sign is reflected in a window at Poke Pop on Congress Street in Portland on Wednesday. The restaurant has been open since the beginning of July. There’s even more sweet chili in the Thai-sriracha sauce on the tofu super salad bowl ($9.95), which I tried on my second visit to Poké Pop. Strewn with slippery edamame, thin slices of radish and cubes of fried tofu, my vegetarian bowl came on a base of matcha soba noodles. If there is any place where a syrupy sauce works best, it is here, where the herbaceous green tea in the noodles and oil from the tofu offer at least token resistance to sweetness. But it’s not enough. You can wash everything down with mysteriously flavor-free miso soup ($2.95), or opt for a beverage, like fresh kombucha, available on tap, or milk teas prepared with and without boba, like Thai iced tea ($4.25), which is a little chalky, or Taro milk tea ($4.25), weirdly brewed with floral jasmine tea. Imagine sipping a bubble tea where bits of potpourri at the bottom have replaced tapioca balls. After tasting a few menu items with inexplicably peculiar tweaks, it starts to feel as if Poké Pop’s enthusiasm is about disruption and innovation for their own sake, rather than positive results. Take the sushi burrito as an example. Any of the restaurant’s bowls can be converted to this format, where rice and toppings are rolled into a nori-wrapped log and cut once down the center. 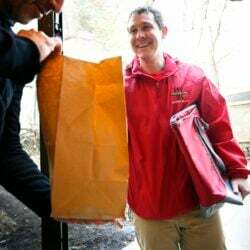 Poké Pop is certainly not the first to sell what is essentially extra-large, unsliced maki sushi as a “burrito,” but they may be the first to package it in a bullet-like, bespoke cardboard container. Sure, the chirashi burrito I tasted ($11.50) contained way too much lettuce and a miserly portion of tuna, salmon and hamachi, but the graphical, orange-white-and-red hexagonal box it comes in certainly is cool, right? The chirashi poke bowl at Poke Pop on Congress Street in Portland. There is no pork on the menu at Poké Pop. 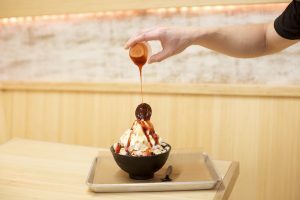 There is dessert though, in the form of Limsitong’s reimagined Korean fruit bing soo – shaved ice bowls that are usually served with compotes, whipped cream and a few other toppings. For his amped-up version, Pop creates a milk-based ice that he shaves into a plastic cup, then layers with ingredient after ingredient. Why use three when eight will do? My mango bing soo ($7.95) began with a base of fruit-cocktail-flavored nata jellies, then moved sequentially up to: grainy shaved milk ice, a chocolate cookie, chewy mini-mochi, whipped cream, mango ice cream, Frosted Flakes cereal, toasted almond slices, and surprisingly, no actual mango. Anusat “Pop” Limsitong puts the finishing touch on a shaved-ice dessert. Bing soo are not normally built on such stratifications of sweet excess. For that, you have to turn to their over-the-top Filipino cousin, halo halo. It is hard not to love a good halo halo: a parfait where every spoonful excavates something new from the glass. In their frenzy to add as many flourishes and embellishments as possible to their bing soo, Poké Pop took an unintended (according to Pop) southerly detour and created the area’s first halo halo. It’s wacky and totally indulgent, and each one takes 15 minutes to prepare, but I could happily eat three. What must not be an accident is that this fever-dream of a dessert echoes note-for-note the animé-inspired graphical wall mural that greets visitors the instant they walk through the glass doors. You can’t help but take it in before you see the stylish, vertical bamboo tabletops and LED strip lighting that illuminates the 25-seater. In a flash, you are shown a fantastical perspective on Portland and its poké, represented in a propulsion of color, with a Voltron-like robot towering behind. The statement is clear: If you think you understand poké, you are about to learn something new. Message received.